1. In small bowl, whisk together garlic, preserves, lime juice and soy sauce. Set aside 1/2 cup apricot mixture. Place chicken in large zip-top plastic bag; pour remaining apricot mixture over chicken. Seal bag; refrigerate 1 to 2 hours to marinate. 2. In medium bowl, mix brown sugar, pineapple juice, vinegar and allspice. Add nectarines, plums and cherries; toss to combine. Cover and refrigerate until ready to serve. 3. Prepare outdoor grill for direct grilling over medium heat. Remove chicken from marinade; discard marinade. Place chicken on hot grill rack and cook 18 to 20 minutes or until chicken loses its pink color throughout and internal temperature reaches 165°, brushing chicken occasionally with reserved apricot mixture and turning once halfway through cooking. 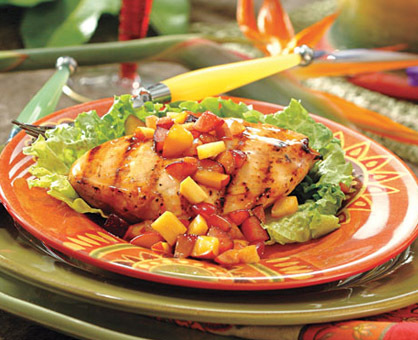 To serve, spoon fruit mixture over chicken and sprinkle with cilantro, if desired. Additional fruits that also work well in this dish are peaches, apricots and mangoes.